Gold futures moved lower for a third straight session Wednesday, logging a fresh two-month low, but then advanced in after-hours trading following the Federal Reserve’s decision to keep its benchmark interest rate unchanged. Gold for June delivery edged down $1.20, or less than 0.1%, to settle at $1,305.60 an ounce on the Comex division of the New York Mercantile Exchange. The settlement is the lowest since March 1. The yellow metal was near $1,312 an ounce in electronic trading after the Fed’s announcement. "The Fed’s decision is showing us that the Fed is willing to let its inflation overshoot its 2% target and accommodate growth," MarketWatch quoted Peter Spina, president and chief executive officer of GoldSeek.com. "This should be favorable to growing inflation forecasts" and make the appeal of gold grow. 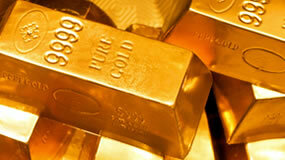 Gold futures ranged from a low of $1,304.30 to a high of $1,312.50. They dropped 0.9% on Tuesday and dipped 0.3% on Monday. Silver for July delivery advanced 24.8 cents, or 1.5%, to close at $16.375 an ounce. Silver futures traded between $16.17 and $16.49. They declined 1.7% on Tuesday and fell 0.6% on Monday. July platinum dipped 40 cents, or less than 0.1%, to $893.80 an ounce, ranging from $893.10 to $901.30. Palladium for June delivery gained $23.90, or 2.6%, to $960.15 an ounce, trading between $938.65 and $966.60. United States Mint bullion sales were unchanged. Below is a sales breakdown of U.S. Mint bullion products with columns listing the number of coins sold during varying periods.